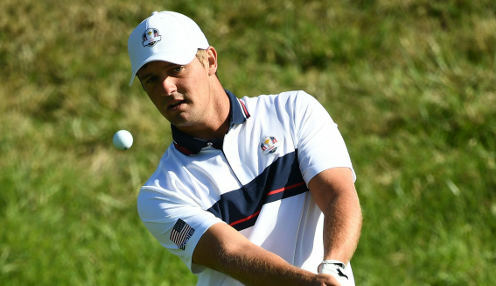 After recording the first hole-in-one of his life during the final round of the Masters, Bryson DeChambeau revealed he is still working on his swing ahead of the RBC Heritage. The 25-year-old's Augusta experience started and ended well - he tied the lead with a first round 66 ahead of the Sunday ace - but could only manage laps of 75-73 in the middle of the week. "I knew something was going to happen this week, I just didn't know what it was going to be," he said. "Obviously shooting 66 the first round I thought it was going to be something even more special. "But making my first one on the 16th is cool. I knew this would happen three years ago. I said to my caddie and to everyone in my camp 'I'm going to make a hole-in-one here one day', and sure enough it was my first one three years later." Having claimed four wins in eight starts before and after New Year, he has now gone six starts without a top ten. However, he also has two top-four finishes in three starts at this week's venue, Harbour Town Golf Links. The problem is that 'The Scientist' is a little unsure about his swing. "We haven't figured out my irons yet," he admitted. "There's more work to be done and I struggled really badly with putting." His fellow American Xander Schauffele is also making the journey to Harbour Town, in his case after finishing in a tie for second which left him ruing a lack of Augusta nous, but thrilled to have participated in the historic tournament. "It was an awesome experience," he said. "It's hard to really feel bad about how I played because, you know, I just witnessed history. "I feel like I got a very full Masters experience here in my second year and I think this situation is very unique, because I'm not one bit sad." DeChambeau is 19.00 to win the RBC Heritage, with Schauffele available at 19.00.